Heat oven to 350°F. Generously spray 24 regular-size muffin cups with cooking spray. 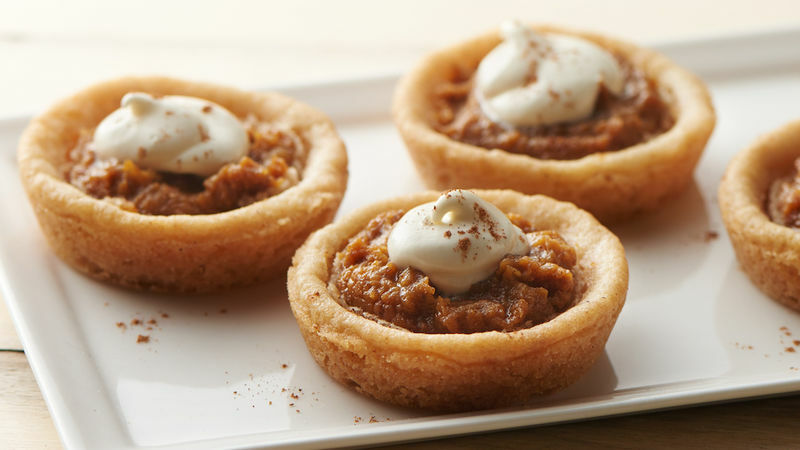 In large bowl, mix cookie dough, flour and 1/2 teaspoon of the pumpkin pie spice. 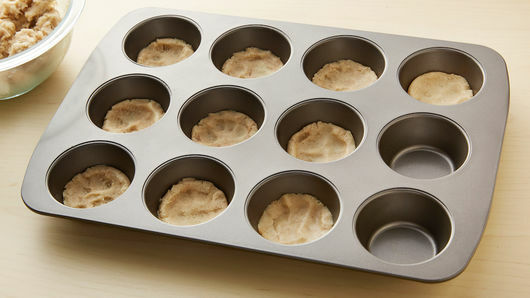 Firmly press 1 tablespoon cookie dough evenly in bottom of each muffin cup. Bake 10 minutes. Meanwhile, in medium bowl, mash drained sweet potatoes, and measure 1 1/2 cups, reserving remaining for another use. Add remaining 1 1/2 teaspoons of the pumpkin pie spice and 1/4 cup of the powdered sugar to the 1 1/2 cups mashed sweet potatoes; mix well. 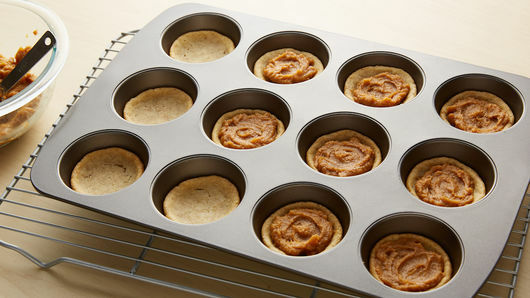 Place about 2 teaspoons sweet potato filling on center of each cookie, and spread in each cup to within 1/4 inch of edge. Bake 10 to 15 minutes or until edges are golden brown. Cool 10 minutes in pan; run metal spatula or sharp knife around edge of each cookie cup to loosen. Cool completely in pan, about 20 minutes. In medium bowl, beat marshmallow creme, softened butter, remaining 1/2 cup powdered sugar and the vanilla with electric mixer on medium speed, or stir until smooth. Transfer to resealable food-storage plastic bag. Cut off one bottom corner; squeeze small dollop of frosting on top of each cookie cup. Sprinkle cookies with additional pumpkin pie spice for a nice finish, if desired. Though we love a generous slice of classic sweet potato pie, sometimes all you need is a little bite of something sweet after a big holiday dinner, and that’s where these adorable sweet potato pie cookies come in—they have all the best flavors of classic sweet potato pie (including a dollop marshmallow buttercream on top!) but are bite-sized. Don’t be fooled by this sweet treat’s appearance. These cookies are much easier to make than they look thanks to refrigerated sugar cookie dough, canned sweet potatoes and a muffin pan. Not a fan of canned sweet potatoes? Not a problem! You’ll just have to plan some extra time to bake fresh sweet potatoes first. Not sure how to cook sweet potatoes? We have the answer, whether you want to make them in the oven or the microwave! There are so many other delicious sweet potato recipes out there—check them out!